As you know, I love exploring new cuisine. One of my Taiwanese friend cook some of his food. A few ingredients might not be found in some regular supermarket. You might have to go to some specialized stores. Here is one of his favorite recipe. It is basically fine rice noodle with seafood and importantly, the key ingredients for this successful dish are the Taiwanese BBQ sauce and nappa cabbage. 1. Soak rice noodle into wok for 10-15 mins. 2. Meanwhile, devein shrimp, cut squid into rings, cut nappa into large pieces. 3. Heat wok over high heat, add nappa, BBQ sauce and salt. Cook until tender. 4. 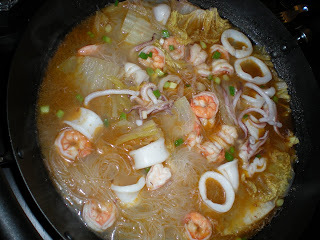 Add seafood and cook for 5-6 mins. Seafood does not take too long to cook. 5. Sprinkle green onions and turn off. Serve.